Full House is a family show that I grew up watching and now my kids get to enjoy it thanks to Netflix. 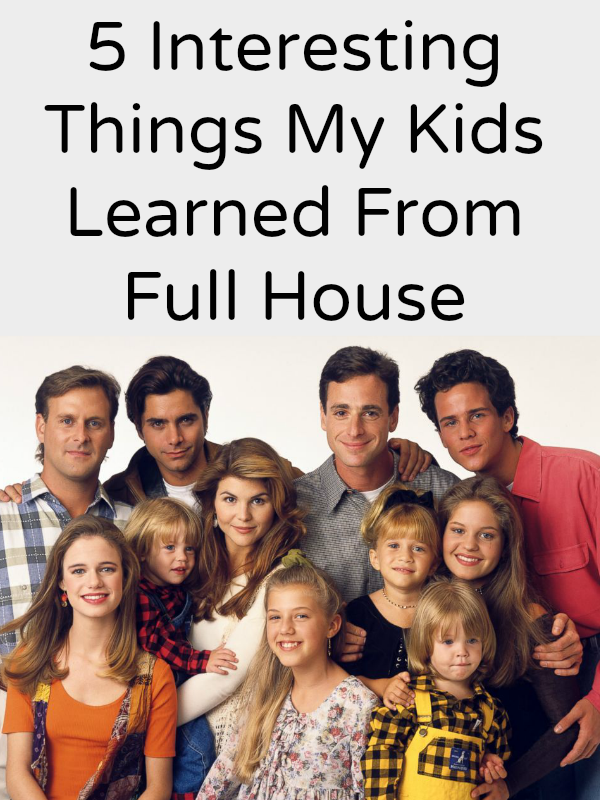 Now as we await Fuller House; the remake which premieres in February 2016, I reflect on what my kids have learned through watching the Full House episodes, repetitively. I know who Elvis and the Beach Boys are because my parents listened to that while I was growing up, I love them too. But it wasn’t the music of my generation so when my kids heard me listening to my music, it was more of the 90s music than anything else. However that doesn’t mean I don’t want my kids to know the great rock and pop legends. Thanks to Full House, they know who Elvis and the Beach Boys are and even know some of their songs! The way that Danny Tanner ran the household showed that they had some major family values. I like that my kids are seeing another family other than their own growing up in a loving way. When my kids forget to be respectful when talking to us, they are reminded that it’s not okay just from watching their shows. Things may be different today but Full House reminds them that families are meant to be treasured and they better treasure theirs. I talk about how life was different when I was young all the time but it’s another thing entirely to see it played out before you. Full House takes place in the 80s and 90s, which is also when I was growing up. So my kids get to see the clothing and hair styles I wore, the toys I played with (I literally recognized toys I owned) and the music I listened to. It’s like a window into their parents lives. My older two girls fight like cats and dogs. I try to foster love between them but they are too close in age I guess. I know someday they will appreciate each other. In the mean time, they get to see sisters helping each other out on Full House. I hope it reminds them that sisters are to be treasured. This last one is a bit more light hearted but my girls both learned jokes from Full House. There is an episode where Michelle and her friend call this paid joke telephone line and get jokes while racking up the phone bill unknowingly. They tell jokes the whole episode and you bet that my kids go around saying the same ones. I think Full House is a great show and I’m glad my kids get to watch it. We can’t wait for Fuller House and I hope it has a similar effect.